Developing industry leading plantable retaining walls, Soil Retention now boasts a line of three cutting edge products to help commercial and residential customers alike in constructing the ultimate home, garden, commercial space, or drainage areas in the Santa Clarita area. Headlined by their Verdura retaining wall system Soil Retention has also added their own Drivable Grass and Enviroflex systems to aid in the construction of small home gardens all the way up to large commercial structures. Ameri-Turf is a lawn improvement company that provides the best quality grass for your home’s surrounding areas. Their base in Fairfield, California is a farming house for all your lawn care requests. They have a mission to bring you home grown grass with high quality service, at a reasonable price. Since they grow the merchandise themselves, customers cut out the middle man and go directly to the source. This cuts the cost immensely and provides a win-win situation for both the client and the contributor. With over 50 years of experience in growing sod and marketing it as well as other commodities, they are prepared with the wisdom that comes from such an extensive background to procure your home with the finest grass. Grown on irrigated fields and planted with high quality seeds, Ameri-Turf produces sod that comes in three brands: Kentucky bluegrass, blue-rye, and their featured product Rhizomatous Tall Fescue (RTF). RTF sod is their prized product, being the next generation in tall fescue sod. 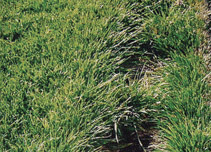 Rhizomatous Tall Fescue not only is drought tolerant and durable, but respects Mother Nature and keeps peace with her. It reduces your “carbon footprint” and will put money in your pocket when the water bill comes around. Not only has it been proven to be self-repairing without clumping, but has a fine texture that makes it optically attractive. Whether it’s home lawns, sports fields, parks, gold courses, or commercial sites-RTF will improve the ground it is installed in. Ameri-Turf stand by their word that they care about their customers when they state, “At Ameri-Turf sod farms, we grow the highest quality sod to meet the needs of discerning homeowners, landscape professionals and athletic facility managers. With farms in Northern California and Indiana, they have expanded their merchandise to also sell a variety of other landscaping supplies, making it clear to see their rapid growth in success is well deserved. The benefits of RTF seem endless, and include more than ten reasons for why it is so popular in demand. These include but are not limited to: excellent insect and disease resistance, will not brown out in the intense summer heat, adaptable to a wide range of soil conditions, and strong, deep root system and drought tolerance. Especially coming from a state where it blisters in heat, or widely changes temperatures throughout the seasons, this product stands above the rest in tolerance. Whether you need new grass or a replacement, Ameri-turf is there for you. So contact Ameri-turf for any of your lawn improvement needs, where they promise it’s “The only Sod you’ll ever need”. 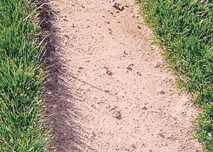 For more information about Ameri-Turf, click here.